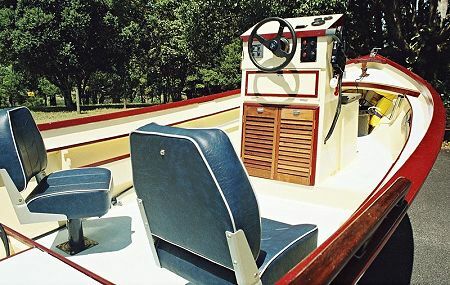 I'm sending these photos of our recently completed Console Skiff. 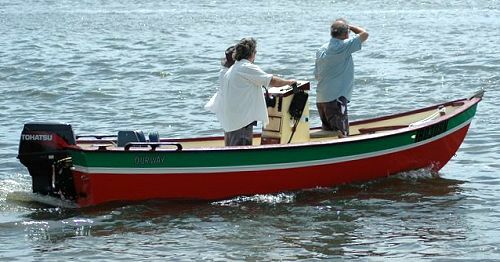 She started life as a Cabin Skiff but as the construction slowly progressed (over 15 years!) my family grew, to the point where they wouldn't all fit if I'd kept the cabin. So the cabin was done away with but the raised bulwark and deck were retained. I believe this keeps the boat drier than otherwise and the deck gives us a handy little area for rigging lines etc. "Ourway" is powered by a 50hp 2 stroke Tohatsu (fitted with hydrofoil) and performs beautifully. We plan a long life of exploring the rivers of Northern NSW and Queensland. I'd be happy to correspond with other builders and to share my experiences. Your patterns were easy to follow, a tip that I can share is to use a leatherwork stitching marker to roll over the plan lines, they will be transferred in a line of easily seen dots to the ply.